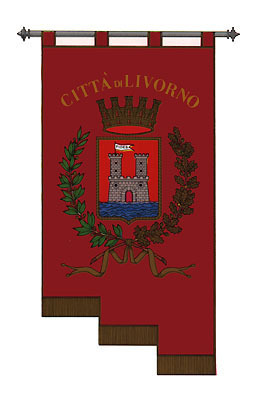 Livorno is in Livorno province, Tuscany. Gonfalone from <www.radicedidue.com>. 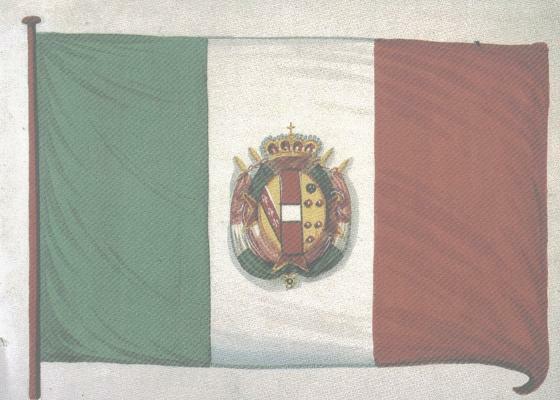 According to <www.flagsonline.it> , the flag of Livorno is red and charged with the coat of arms. The cover of [sie63] shows what the book describes as approximately a quarter of a flagchart, one of many to roll of the, mostly Dutch, presses for the use of seafarers: "Tableau des Pavillons que la Plupart des Nations arborent a` la Mer. Faitau de'po^t des cartes et plans de la marine pour le service des vaisseaux du Roy par ordre de M. de Machault, Garde de se'aux de France. Par le Sr. Bellin Inge'nieur de la marine. 1756." [beL56]. On the 3rd row from the bottom there is "Pav. de Livourne" - A white flag with a narrow malthese cross with arced ends, with at each end a disc as wide as the arm fitting the arc, but not quite touching it, all red. 230 Leghorn - As above but slightly different as the description of the flag in [beL56]. No. 429 - Leghorn (Livorno). 231 Leghorn Galley - As above but without the yellow circle, and using the same cross as on 230 (City Flag or/and Ensign), leaving a bit of white between the two tips of each arm.